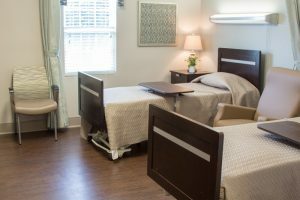 Nestled in the center of a quiet neighborhood, Atkins Nursing and Rehabilitation Center is a facility that offers skilled 24-hour nursing care and rehabilitation services from a qualified staff. We work to see each resident function at their highest possible level and celebrate their lives by providing them with the utmost dignity. Because we understand that cleanliness and comfort are paramount to happiness, we work to create such an environment for our residents. Daily services and amenities include housekeeping and laundry services, excellent meals– including continental breakfasts and snacks –in our beautiful dining room, free wireless internet access to keep both residents and visitors connected, and transportation to and from medical appointments. 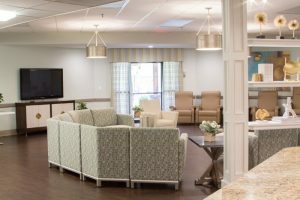 Atkins Nursing and Rehabilitation Center is where residents come first. We provide daily planned activities led by a Certified Activity Director. These activities include social events, outings, trips to tournaments, seasonal celebrations, and monthly birthday parties. One of our most exciting events is our annual “Senior” Prom where all family members are welcome to join for an evening of fun. We also offer pastoral services to our residents. We are a family-centered establishment that encourages family participation in group activities, meals, parties, and special events. To help you plan your, visits we provide a monthly event calendar. Come visit with us, at your convenience, and learn more about our relaxed, welcoming home. We offer respite care to families that need a little extra help caring for their loved ones. These residents are welcomed to enjoy the same amenities as our full-time residents and 24-hour nursing care. Our team of caregivers work to create a comfortable, safe environment for each of your loved one’s needs.